Materials Testing is a highly precise and reliable set of processes that measure material characteristics, mechanical properties, composition, corrosion resistance and the effects of heat treatments against specified criteria. ... Our accredited material testing lab is fully equipped to test Metals and Alloys. Our Material Testing Laborateris are equipped with the latest sophisticated testing equipments. Water is one of the major components used in the many different applications performed in laboratories. It is vital to use the correct water grade or quality to match the required procedures or appliances. Arbro has a strong focus on the analysis needs of the Building Materials industry. Analysis that can be used for the various stages in the manufacturing process of cement, one of the most important and most widely used products in this segment. At Arbro, we believe in providing a total service, not just analysis and reports. 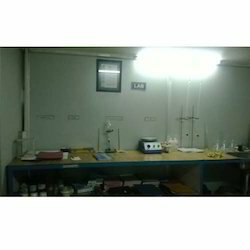 Our Building Material Testing laboratories are equipped with the latest sophisticated testing equipments. our services include not only Building and Road material testing services as well as engineering observation, structural inspection etc. Make Mechanics Optics & Digital Instruments Pvt. Ltd.
Sadekar Enviro Engineers Pvt. Ltd.